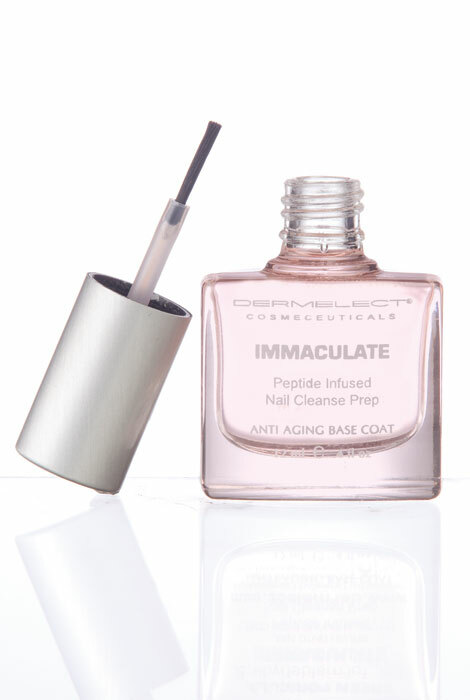 Brush on this age-fighting primer before applying nail color, and watch your manicure last and last. The gentle, non-drying Dermelect® Immaculate Nail Cleanse Prep cleanser primes nails by eliminating oils and invisible impurities, creating the perfect pH balance for the nail surface. Nail polish primer adheres best to clean, healthy nails, and this primer's blend of wool-derived keratin protein peptide, vitamin C and botanicals work together to nourish nails. To use, brush onto nail before applying a base coat. The formulation will evaporate immediately, leaving nails completely dry and ready for polish. SD Alcohol 40-B, Etocrylene, Water (Aqua), Fragrance, Butyl Acetate, Aqua (and) Hydrolyzed Keratin, Carthamus Tinctorius (Safflower) Seed Oil (and) Citrus Grandis (Grapefruit) Fruit Extract, Propylene Glycol & Aqua & Citrus Medica Limon (Lemon) Peel Extract, Ascorbic Acid (Vitamin C), Red 17. Brush onto nail before applying base coat- the formulation will evaporate immediately, leaving nails completely dry. tried a sample size you offer with other nail products of Dermelect and love all. Never used a nail cleanse prep before.